This post was submitted by Melissa Hayden (Bruebach) for Children’s Miracle Network Hospitals through childrensmiraclenetworkhospitals.org/guest-post. Your wedding day: the day you (probably) have at least thought about at some point in your life, and the day most people dream about. In November 2017, my boyfriend proposed, and we were thrilled to be able to start planning that day that I had been dreaming about! 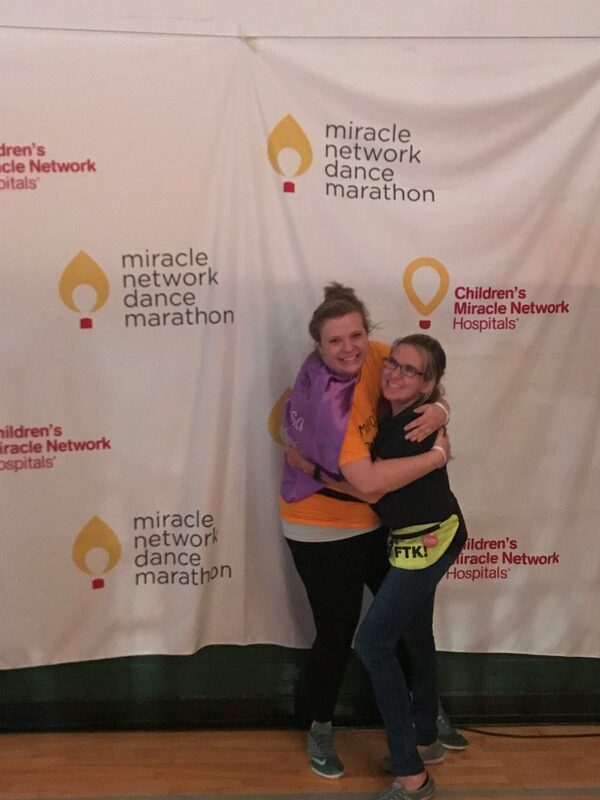 Just a week before that, I had participated in my 5th Dance Marathon, and spoke for the 4th time as a “Miracle Child” to share my story. As usual, I left the event feeling inspired, grateful, and full of energy (with very sore feet too, of course). 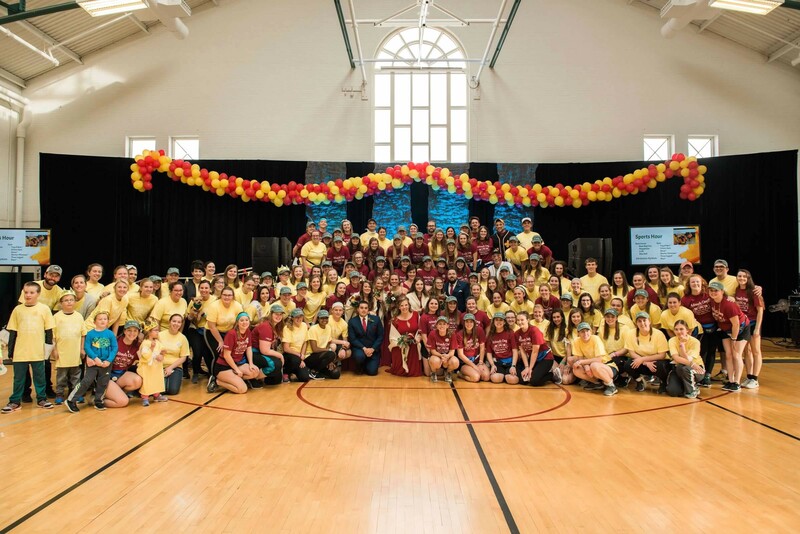 There is absolutely nothing like a Miracle Day event; hearing stories of courage and triumph, dancing with hundreds of others in the room, and celebrating the organization’s amazing ability to raise funds for their Children’s Miracle Network hospital never ceases to amaze me. 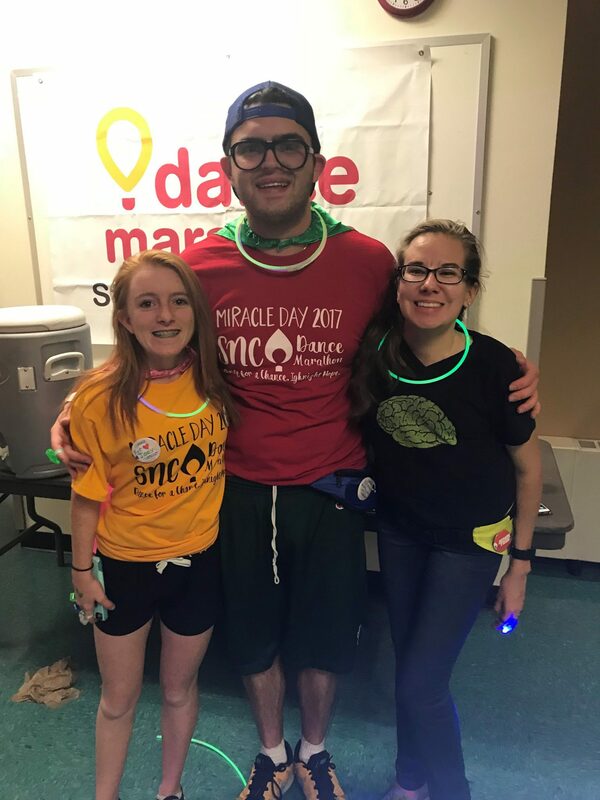 I am truly a “Dance Marathon addict”, I love everything about the organization, and I have personally seen how much of an impact it has on hospitals and their patients. 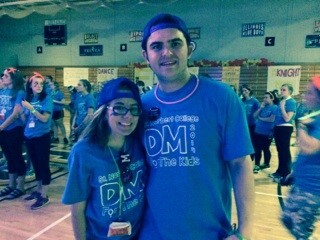 Why am I so passionate about Dance Marathon? I have been, and continue to be, fighting for my life for my entire life. I was born two months early at only ~3 pounds, and have had close 30 surgeries/procedures including ~12 brain surgeries, 3 spinal fusions, and shoulder surgery. I have a genetic condition, called FKBP14 related Ehlers Danlos Syndrome, and when I was diagnosed I was the 10th in the world to have it. I also have hydrocephalus, scoliosis, and CRPS, all of which impact my daily life. For Hydrocephalus, the only treatment is brain surgery, and so I have had to always be prepared for an emergency brain surgery, of which I have had 10 so far. Growing up, I missed many birthdays, holidays, and milestones while I was in and out of the hospital. While this was hard and sad in some ways, the hospital was able to make it as fun as possible, because of money raised from organizations like Dance Marathon. They decorated, Santa came, I was gifted a book for my birthday, they truly do everything they can to make a kid feel like a kid again while they’re going through some of the scariest times in their lives. 2012 was a particularly hard year for me, as I had four brain surgeries in four months, and I missed my junior year of college in order to recover. I developed blood clots and had to give myself shots twice a day for over 8 months, and I had gotten so sick my family was told to say their goodbyes. It took me months to gain my stamina back, and almost a year to fully recover. 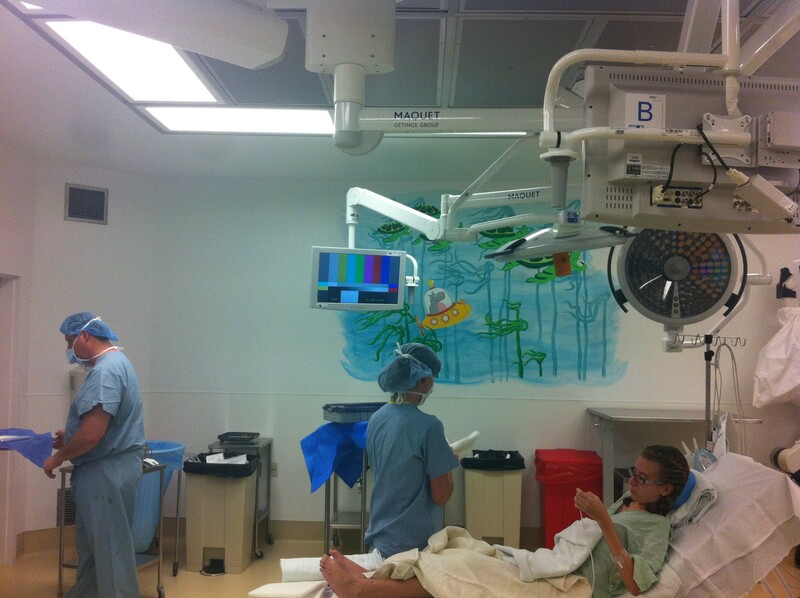 If it weren’t for organizations like Dance Marathon, the hospital might not have had pull out couches in every room. This allowed my parents to be near me at all times, and gave them the option to sleep in my room. 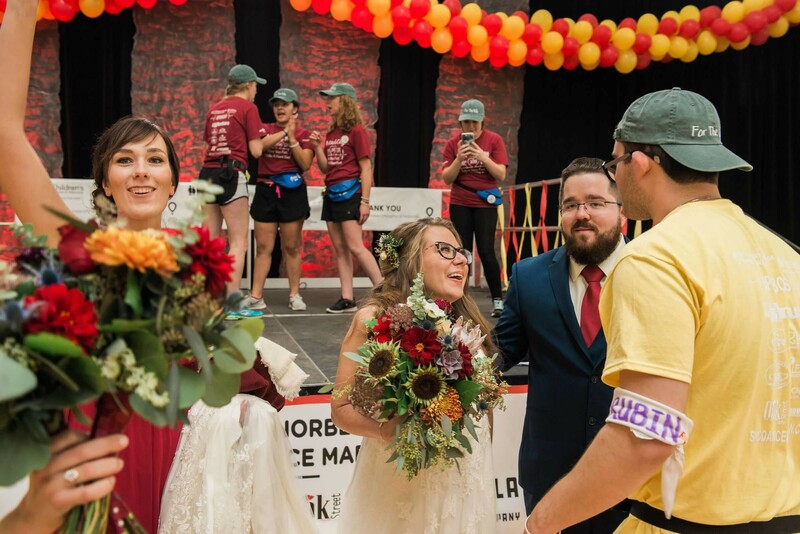 Without Dance Marathon, the hospital might not have had money for research, which allows the doctors to study new ways to treat their patients, and I might not have been here today to share this story. 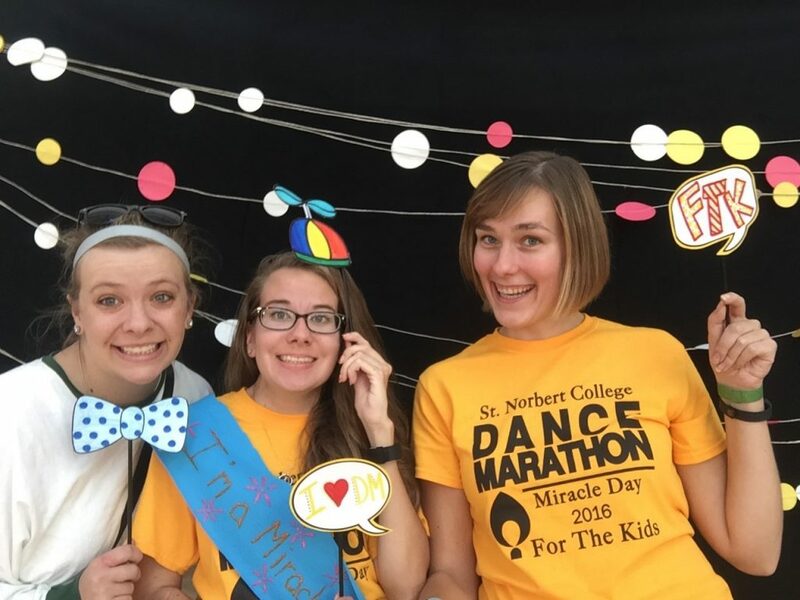 All of these experiences gave me a unique perspective when I first started participating in Dance Marathon at St Norbert College, I knew just how much these families needed us, because most of my life, I have been “that family”. I knew just how much of an impact we were having, and that made me want to work that much harder when I was involved. By now, you’ve figured out just how crazy of a Dance Marathon enthusiast I am, and now here comes the part that still BLOWS MY MIND. While planning our special day we had originally settled on a date in September 2019, but as we planned other parts of the wedding, we realized we wanted to do it sooner than later. As we had already booked a few vendors when we decided to do a date change, we had to coordinate with all of them as to what dates were left available in 2018. It turned out only one date was going to work: November 10, 2018. We agreed to the date, and got back to work planning our wedding that now was almost a whole year sooner! Now comes the crazy part. 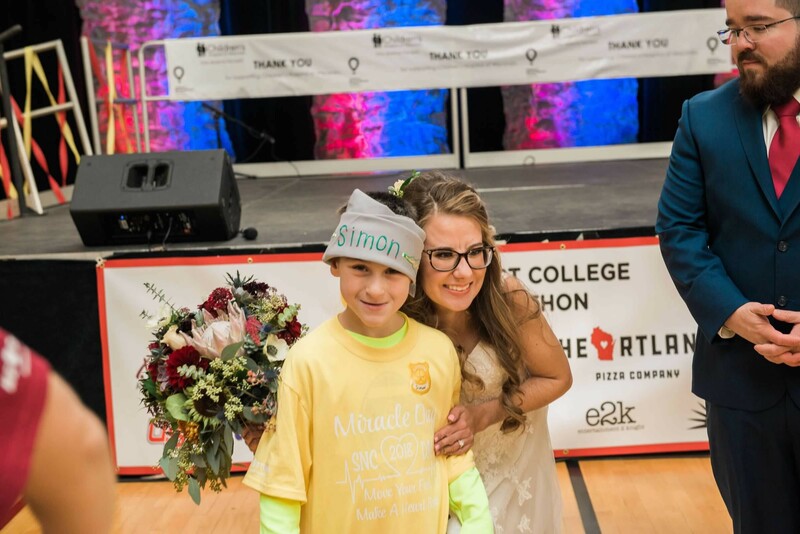 I still get goosebumps when I think back to when I first found out that St Norbert College’s Miracle Day was on our wedding day! It truly was meant to be. 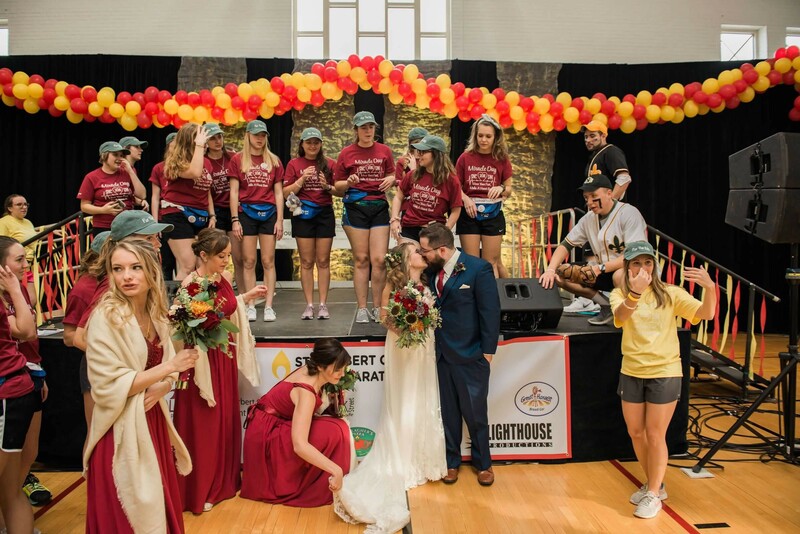 Immediately, I realized we HAD to make Dance Marathon a part of our day, especially because we were already going to be on campus for some of our wedding pictures. 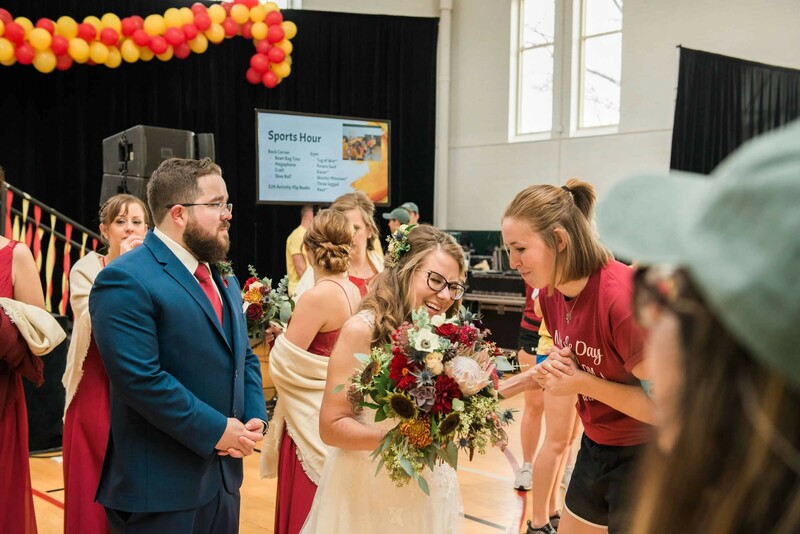 We got ready that morning, eager with anticipation for both the wedding and Dance Marathon! After we did our “first look” pictures, Matt and I bee-lined for the Campus Center where Miracle Day was being held. 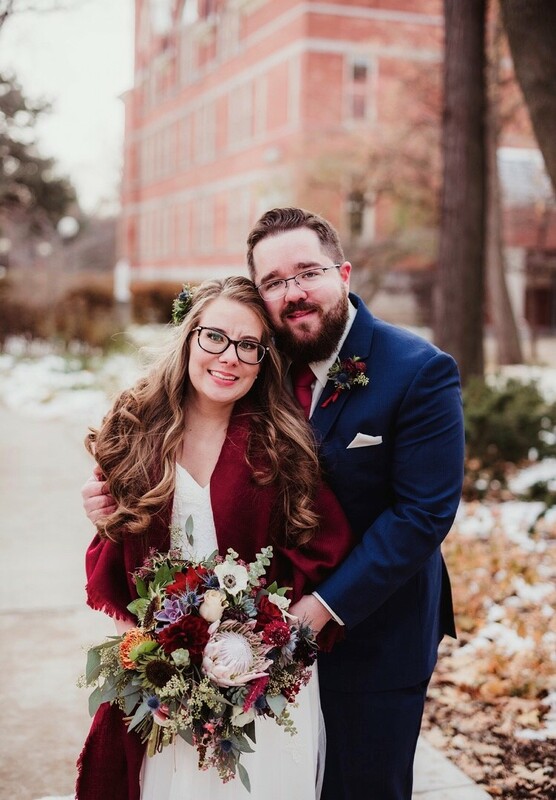 I cannot explain how amazing it was to be able to stop in, if only for a few minutes (we arrived at the chapel with about 20 minutes to spare before the ceremony, whoops, clearly we’ve got our priorities straight). I got to give two of my buddies, other Miracle Children, the biggest hugs which was so special! One of the “Miracle Kids” was Joey Rubin- when we both were SNCDM members he and I found out, in this crazy small world, that we both had the same neurosurgeon in Chicago! He has been incredibly strong as he battled Epilepsy, and we both received treatment at Lurie Children’s Hospital in Chicago. 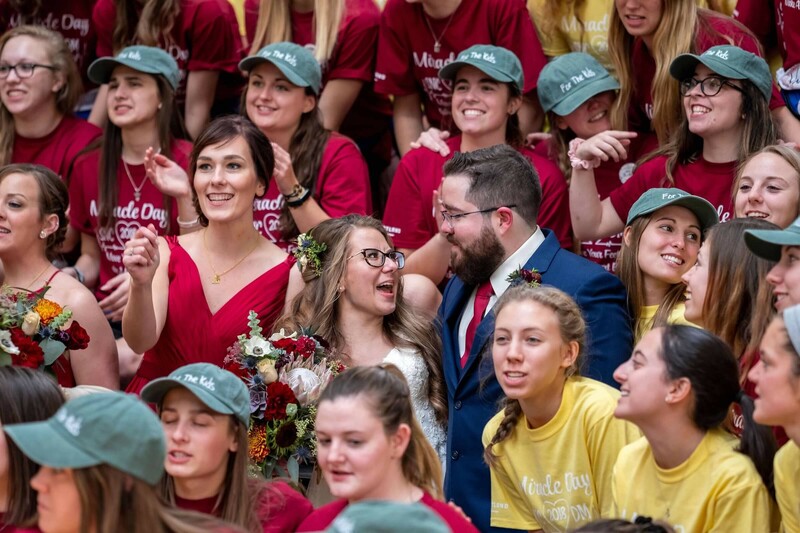 We danced it out for a few minutes with the dancers, and then took a group picture with all of the SNCDM members, Miracle Families, and the Dancers (one of my most favorite wedding pictures! ), and then we left with full hearts to go get married! 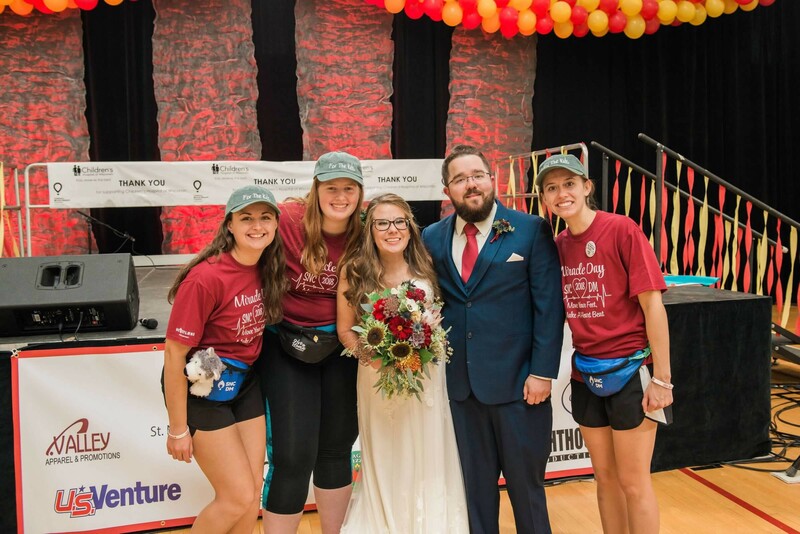 We highly recommend crashing a Dance Marathon before you go get married- it was one of the most special parts of our day! It really came full circle for me when we were standing in the group surrounded by hundreds of dancers. 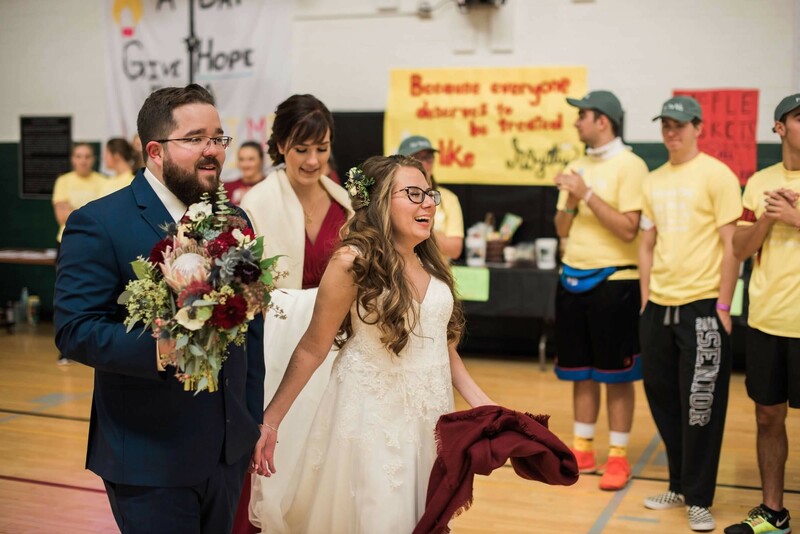 Growing up I was one of the “Miracle Kids”, then I became a Dance Marathon member, and then I got to celebrate our wedding with SNCDM. I looked around and realized we were celebrating the wedding that might not have been possible had I not received the very best medical care at a Children’s Miracle Network Hospital, and I looked at some of the other Miracle Kids; I knew that someday they might be getting married too, and my heart was SO full knowing that they had this chance because of their Children’s Miracle Network Hospital, and the dancers in the room. It was one of those moments that just fill you up to the brim with joy. coping|3 bedroom all brick semi-detached near Fanshawe College in London Ontario. around the pool. To be done next week. Also automatic pool cover not ready yet. Concrete Border to Your Driveway|4 Tips On Hiring The Best Stamped Concrete Stamped Concrete Contractor Blog Pattern Patio Driveway|51 Atlantic St.
Highlands. European fan stamped concrete pattern|520 Bradwell Chase realestate executive home on pool sized lot, incredible oversized deck & extensive stamped concrete patios. patio with seat walls and fire pit.|Glowing Stone Apply in Park,Hotel Lobbies,Pathway Borders,Stamped Concrete|ikoyiclubcarpark The ART of Creative Paving Broom Finished Concourse, Stamped Concrete Borders to|ImagineerRemodeling Pros and Cons of Stamped Concrete vs.
Condos What A Home! Beautiful Stamped Concrete Steps Bring You To The Inviting Front …|MondayMotivation time! extensive stamped concrete patios. Finished lower level with huge above grade windows!|realestate home Meadowlands of Sunningdale. design in middle with handswirled finish inside. concrete|stamped-concrete patio….looks like slate! and Stamped Concrete, of Fort Mill, South Carolina, was driving the wrong way on I-77 in the median…. solns? Is it durable?|@HomeAdvisor Why concrete co.
of, “With the Old Breed”. You did a marvellous job. joists, neutral tan walls and stamped concrete look for the floor, a loft style design MyColorResolution|@skbayless67 Nah, just be careful. tropical landscaping, fire pit, fountain, and stamped concrete patio.|Better than New Construction! Impressive 2-Story withWetland Views. Lighting. Immaculately Maintained Backyard* Spacious Modern Bedrooms.|Just Listed Stunning Mattamy Home. pm. WOW!!! 1/2 acre cul-de-sac lot accented by a large stamped concrete patio and beautiful landscaping. BACKYARD WITH STAMPED CONCRETE AND YOUR OWN TIKI HUT. very beautiful. …|Great video showing the stamped concrete process. path to sprucing up street appeal…staining the stamped concrete. patio is more than enough to turn a drab space into a first-class outdoor lounge. property in Fort Lauderdale, Florida. a private lot with a stamped concrete heated drive, hand crafted doors and covered rear porches! game room|A1 we need the front porch redone and stamped concrete touched up ETNHolmesChatSafety|A4) big challenge is stamped concrete patio maintenance Resealing made it slippery when rains ASCanadaDIY|Achieve decorative finishes that replicate granite, slate, stone, brick or wood aesthetics with Increte Stamped Concrete. staining stamped concrete creates a beautiful, textured appearance. with Stamped Concrete Overlays. Call (720) 545-1766 to more about its benefits! flagstone walkway and fire pit its all coming together nicely.|Advantages of Stamped Concrete vs.
Designs|Amazing Stamped Concrete Walkway For Modern House Ideas Using Wooden Entrance Gate Designs|Amazing Stamped Concrete Walkway For Modern House Ideas Using Wooden Entrance Gate Designs|An amazing Pool deck in stamped concrete with slate skin pattern. trained professional. 860-919-7819|An entertainer’s dream! – @Surrey. …|Anything Concrete Inc Provides Concrete Crack Repair, vancouver stamped concrete, leaking Foundation in …|Anything Concrete Inc Provides vancouver stamped concrete, leaking Foundation & crack repair in @Vancouver – …|Are you deciding between pavers vs.
of summer? So are we. Get ready for MemorialDay with a stamped concrete patio or fire pit for your backyard. and so on. Call/WhatsApp us on 08188276300, 08188276305. STAMPED CONCRETE DESIGNS FOR YOUR DRIVEWAY. stamped concrete|Awesome new listing in SE Mandan and just a few blocks south of Fort Lincoln elementary! Lets look at the art of ‘stamped concrete’ , where patterns are stamped into the wet concrete. out the best in your surroundings.|Basement Floor by Stamped Concrete: via @YouTube|Basement floor smooth sweep trowel finish, by Stamped Concrete: via @YouTube|Basement Floor….How Do You Deal With The Drip Holes? in Riverview subdivision with 2 master bedrooms and a third large bedroom. You will walk up to a covered front porch w/stamped concrete, large cedar wood posts & one of the most beautiful views in Polk County. out first floor, wood and stone accent walls, granite counter tops). stamped concrete makeover finishes. Kindly RT as our customers may be on our TL. consider decorative concrete first. We offer premium Stamped Concrete Overlays and Spray Texture. way Bon has the tools and materials you need. products mix design and functionality, so that your stamped concrete driveway and stairway serve its main purpose as well as improves your house’s appearance. as this with stamped concrete overlay. CALL (636)…|Bored with old concrete driveway? Time to start framing the roof!|Brick Herringbone Stamped Concrete patio and walkway.|Brick pavers are a beautiful, more durable & economical alternative to other concrete surfaces. Designs – Adding Quality, Durability and Esthetic Appeal to Your Property|Build long lasting high end surfaces with our wide range of stamped concrete patterns and colors. avoid fungus growth and cracks of pavement blocks. your free estimate. Stamped Concrete, Colored Concrete, Retaining Walls. Chromogen Release Powders for stamped concrete professionals. home! This charming 3-bedroom detached home is in a highly desired location in south Cambridge. The…|Check out this cool Stamped Concrete driveway in geometric pattern! 4-season 16’x24′ building for multi-use space (heat, hydro, cable, ..|Check out this gorgeous home! ..|Check out this gorgeous home! Very private 0.5-acre property on a quiet cul-de-sac with an oversized pool, surrounded by stamped concrete. dial in the exact value in your mission. on a quiet tree lined street in North east London. driveway and large lot.|3 Must-Know Facts About Stamped Concrete|3 Seasons addition & new siding complete. happen using the highest quality material and best craftsmen. @Pella_News|3 things remaining still: 8ft stamped concrete border around the pool. three-car garage, custom kitchen, finished lower level, media room, stamped concrete patio, fenced backyard and in-ground pool. extensive stamped concrete patios. Finished lower level with huge above grade windows for max sunshine|520 Bradwell Chase realestate executive home on pool sized lot, incredible oversized deck & extensive stamped concrete patios. to|ImagineerRemodeling Pros and Cons of Stamped Concrete vs. Stamped Concrete. Read Blog:|Protip: apply a durable coating to protect those beautiful Stamped Concrete on your driveway coating concrete driveway|realestate home Meadowlands of Sunningdale. steps and backyard patio vs other solns? Is it durable?|@HomeAdvisor Why concrete co.
are looking to get a few quotes for a patio installation. Most likely looking at stamped concrete but possibly open to pavers. many of the brick ones in @CityofEdmonton. Brick is not smart in our climate. stone, and we love it. Get lots of compliments on it, too. concrete!|A beautiful landscape with faux rock waterfalls, planters boulders, streams and stamped concrete decking. …|A beautiful landscape with faux rock waterfalls, planters boulders, streams and stamped concrete decking. front porch. Is your front step needing an update? Can’t do this with stamped concrete.|A path to sprucing up street appeal…staining the stamped concrete. a little sun left to enjoy. YAY! streetappealhelpssell|A recent recolor of a warn and weathered patio and walkway in North Tonawanda. Learn more about our options and how you can add this to your property when you call today.|A stamped concrete walkway definitely makes for a warm welcome. look of natural materials at a fraction of the cost. and your usage by installing stamped concrete overlays. applied two coats of a solvent-based sealer. Hired a trained professional. stamped concrete patio recently sealed thanks to dry fall weather! my pool repaved. I want stamped concrete around my pool and in my driveway.|ATTRACTIVE STAMPED CONCRETE DESIGNS FOR YOUR DRIVEWAY. Lincoln elementary! Fabulous views of the prairie with no back neighbors! a covered front porch w/stamped concrete, large cedar wood posts & one of the most beautiful views in Polk County. mats and Super Stone® products never disappoints! What a gorgeous…|Beautify your driveway with Bomanite’s expertise in Stamped Concrete and Architectural Concrete. concrete. Either way Bon has the tools and materials you need. Garage|Brick Herringbone stamped concrete and new door installed. Set SM 4010. Stamped Concrete Brick …|Brick Stone Border Stamp 3 Pc Set SM 4010.
concrete.|Call now for decorative stamped concrete and avoid fungus growth and cracks of pavement blocks. do is prep & put the finishing touches on a project. Stamped Concrete … …|Certified installers 3d, Stamped Concrete, Reflector Floors etc group pictures after training|Chaotic launches Chromogen Release Powders for stamped concrete professionals.